ELLIJAY, Ga. – Ingles Markets has become the latest in a line of businesses offering a little extra to their employees after recent changes in taxes. According to a letter to their employees, a one-time, seniority-based bonus will be offered to qualifying associates as a result of the recent tax reform. 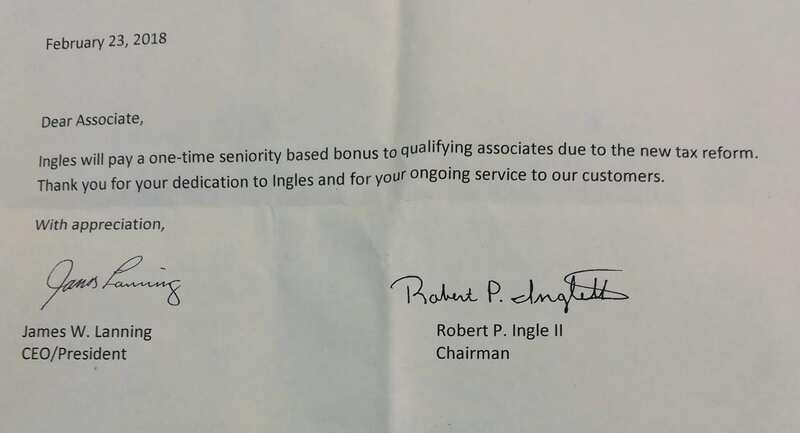 FetchYourNews contacted Chief Financial Officer Ron Freeman of Ingles Markets to inquire further about the bonus. Freeman offered one comment saying, “We are happy any time we can pay our associates a bonus.” Freeman did not offer any further details on the bonus or its delivery. The letter, sent on Feb. 23, confirmed the news with signatures from Chief Executive Officer/President James Lanning and Chairman Robert Ingle Jr.